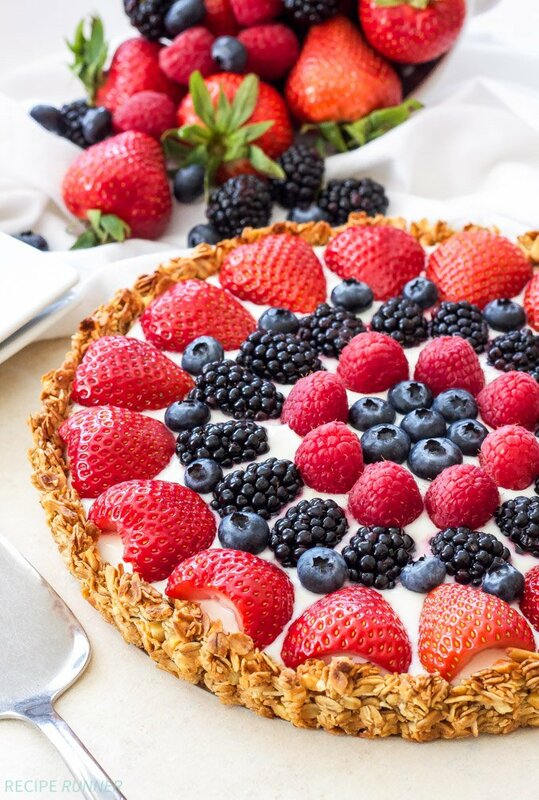 This Berries and Yogurt Breakfast Tart with Granola Crust will have everyone running to the breakfast or brunch table! 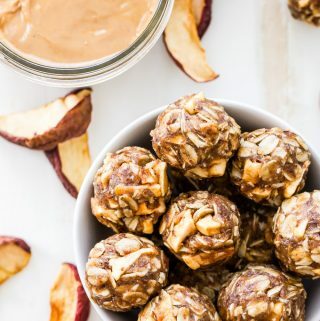 Not only is it a show-stopper, but it’s made with all healthy ingredients, completely gluten-free and tastes amazing! One of my favorite spring desserts is a fruit tart. It’s the perfect time of year to make one because of the abundance that you can find after a not so great selection all winter. I always thought that fruit tarts were almost acceptable to eat for breakfast or brunch, I mean they’re covered in fruit after all. 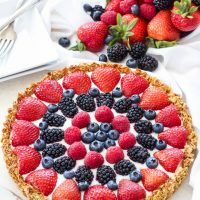 Of course there’s that thick buttery shortbread crust to consider and the rich pastry cream filling….it kind of crosses out the healthy factor of the fruit. Well, I decided that it was time I made a fruit tart that was acceptable to eat for breakfast. 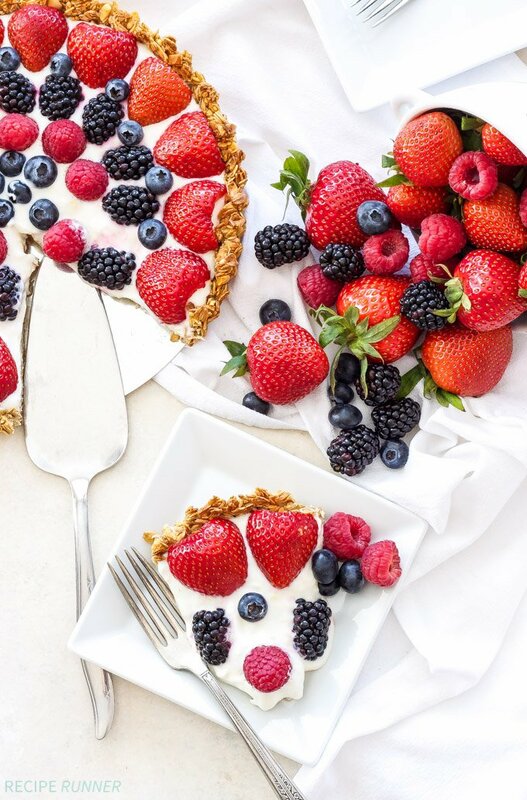 This Berries and Yogurt Breakfast Tart with Granola Crust was the answer. Instead of a buttery shortbread crust a homemade and completely gluten-free granola crust was the perfect healthy substitution. The crust is made with Bob’s Red Mill Gluten-Free Rolled Oats, toasted almonds, shredded coconut, an egg white, honey and coconut oil. Everything is combined just as you would when making granola only instead of spreading it out onto a baking sheet you press it into a tart pan. Obviously I couldn’t keep pastry cream as the filling for this breakfast tart, I mean I could, but then I’d have to go for a second run. Instead I filled that granola crust with lemon Greek yogurt. If you’re short on time just buy lemon flavored Greek yogurt, but if you have a few extra minutes try making it my way using fresh lemon zest and juice and sweetening it with honey. I always prefer to sweet and flavor yogurt myself because I can control the sweetness, flavor and I know exactly what ingredients are going into it. 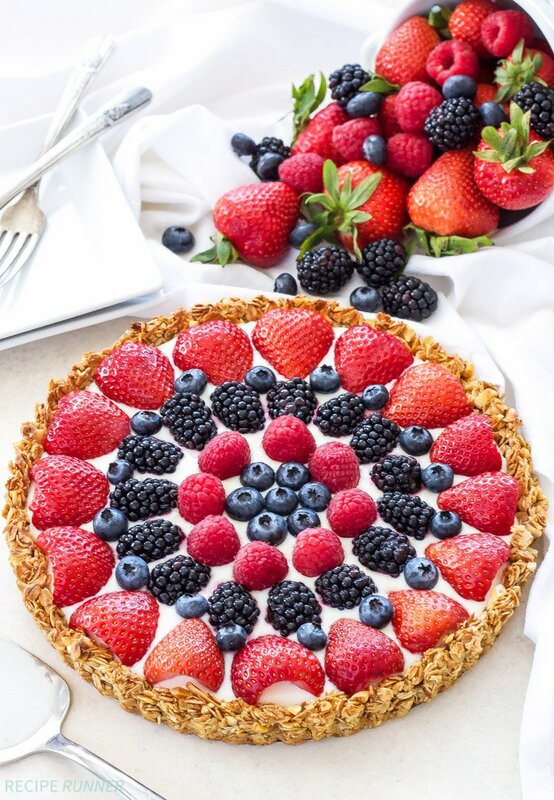 The final step to this Berries and Yogurt Breakfast Tart is of course the berries! I’ve been so impressed with the sweetness of all the berries I’ve purchased so far this spring that I knew I had to top my tart with them, plus they look so pretty! I used a combination of strawberries, raspberries, blackberries and blueberries, but feel free to use whatever you like best or whatever looks the best at the store. Arranging the berries was probably the most fun part about making the tart, that’s the artsy-fartsy side of me coming out. I love making food that looks as beautiful as it tastes and this breakfast tart definitely fits both of those categories. 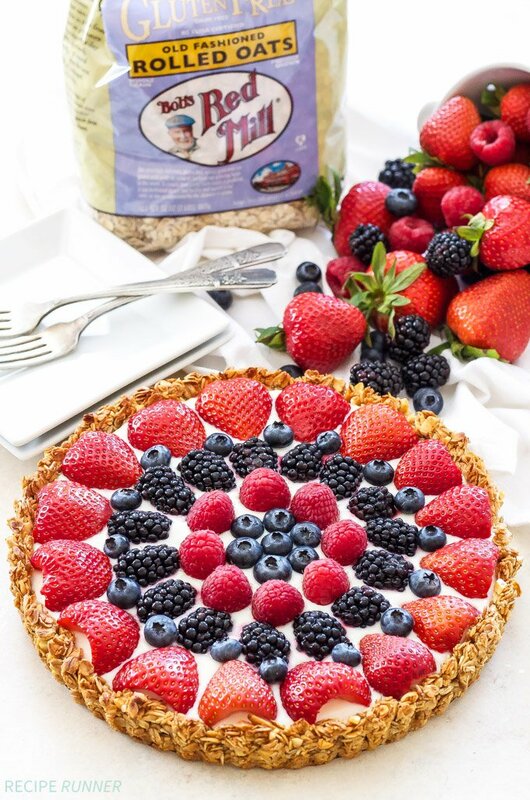 If you’re still trying to figure out what to make for Mother’s Day brunch or any special breakfast or brunch this spring or summer, this gluten-free, healthy, and super delicious Berries and Yogurt Breakfast Tart with Granola Crust is a must! Raspberries, blueberries and blackberries or any berries of your choice. Preheat oven to 325 degrees and generously spray a 9 1/2 inch tart pan with with a removable bottom and place it on a baking sheet. In a microwave safe measuring glass or bowl microwave the melted coconut oil and honey together just until warm, about 10-15 seconds. Whisk in the vanilla and egg white then pour the wet ingredients in with the dry and stir together until everything is coated. Dump the mixture into the prepared tart pan and firmly press down into the bottom and onto the sides using your hands or the bottom of a glass sprayed with cooking spray. 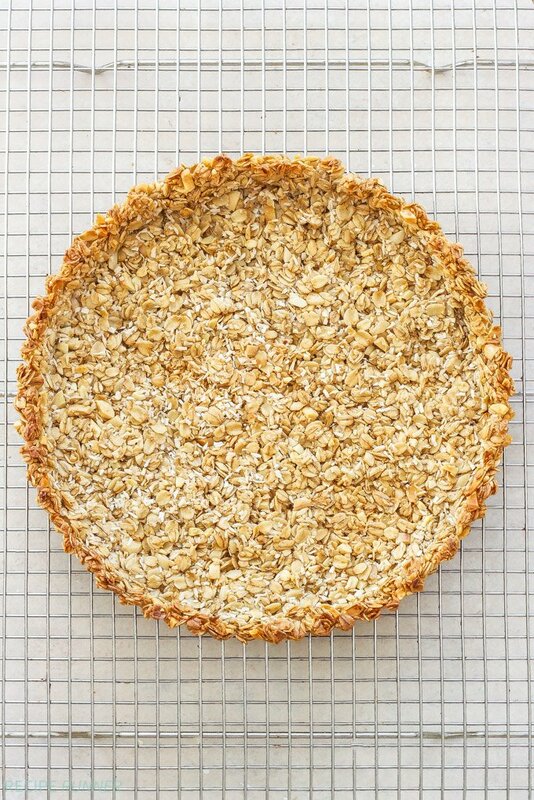 Bake the granola crust for approximately 20-25 minutes or until it is golden brown. Remove from the oven and let it cool on a wire cooling rack before removing the sides of the tart pan. 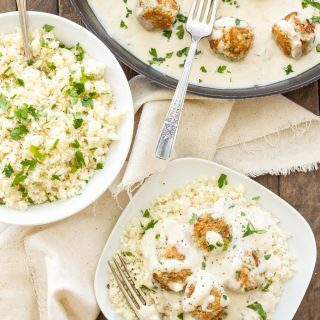 Whisk together all of the ingredients until smooth in a bowl. Place the granola crust onto a serving plate and pour in the lemon Greek yogurt filling, smoothing it out into a single layer. 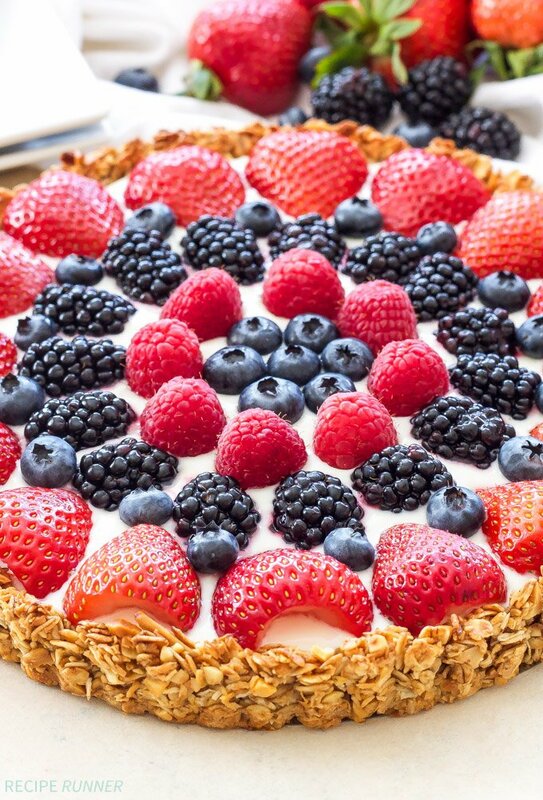 Arrange the berries on top of the yogurt filling in any pattern you desire. This tart is best assembled just before serving as the yogurt will soften the crust rather quickly. Don't expect to get pretty slices when you cut this tart, serve it whole at the table. What it lacks in beauty after cutting it makes up for in flavor! 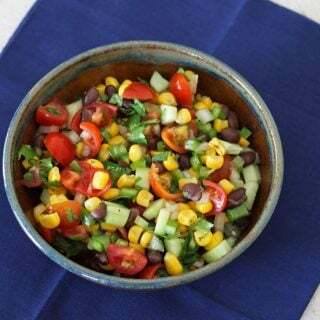 Thanks to the wonderful folks at Bob’s Red Mill for sponsoring this post, I truly love using their products! As always all opinions are my own. This looks like an amazing breakfast! I absolutely love the granola crust! These pictures are amazing. I love the oat crust idea! I would eat this for breakfast EVERY day! Looks so delicious! YES! tart for breakfast...my kind of recipe! I've never thought to use granola to make a crust...what an awesome idea! Thanks Laura, it makes a great crust, especially for breakfast! Hi Cherie, Unfortunately this isn't a recipe that can be made entirely ahead of time. The crust can be made in advance, cooled, wrapped and frozen until needed. The yogurt and berries can also be prepped the day before. But as far as assembling I would wait until as close to serving time as possible as the granola crust will soften the longer the yogurt sits in it.